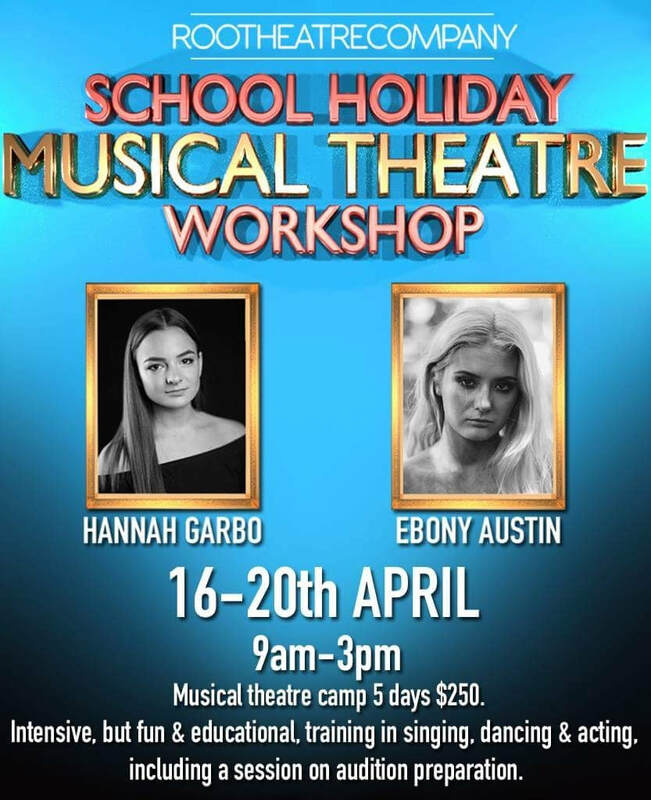 Learn the arts in a fun environment by two of the Illawarra's most acclaimed and experienced musical theatre performers. A 5 day camp for your children during the School Holidays will ensure they are in a safe environment having the time of their lives, and learning at the same time. Designed for those passionate about music theatre; learn songs, choreographed dance routines and apply acting principles in an energized approach to all things musical theatre. Be guided in a reliable approach to song and dance routines and examine what it means to complete a show stopping musical theatre audition! Ebony has trained for 19+ years in various styles of dance including, Jazz, Tap, Ballet, Hip Hop, Contemporary, Musical Theatre, Acrobatics, and MMA. After completing her HSC of Dance with high marks at Wollongong High School of the Performing Arts in 2014, she began professionally teaching and influencing students at multiple studios all over NSW and is back landing a prestige position as a Dance tutor at Wollongong High School of the Performing Arts. Ebony was proudly awarded the Australian Wollongong's Young Citizen of the Year 2018 in January. Ebony has performed in multiple shows such as Candy Man by Wayne Scott Kermond, Southern Stars, School Spectacular, Regional and State Dance Festival as well as touring Movie Word, Dream World and Sea World as a Diane Blaas Tour Performer. Today, Ebony's choreography, teaching and dancing experiences has led her to be an accomplished contracted dancer and model for Gear Model Management - Sydney, Neon Model Management - Australia and Beyond Reason Agency for Dance. Ebony has appeared in BET MTV music videos of Jessica Mauboy, Samantha Jade, Ty Dolla $ign & has choreographed Emalia's upcoming music video. Ebony has choreographed 'Chitty Chitty Bang Bang' at the Roo Theatre and 'Honey Birdette' Valentines Day campaign & is yet to take on board choreographing 'Big the Musical' & 'OLIVER! the Musical' in 2018. Ebony will be appearing in the Commonwealth Games 2018 in Queensland as a featured dancer in both Opening and Closing Ceremonies and is also in works for choreographing 'General Pants Co' newest TV commercial. Launching thePROJECT. NETWORK Agency, Ebony has offered opportunities for local talent to engage more in the professional industry, here she will be mentoring students and clients to their full potential. ​Hannah Garbo is a dedicated performer and singing teacher, currently studying a Bachelor of Music (Specialisation) with the Central Queensland Conservatorium of Music. She has worked extensively in the industry, including under award-winning productions for the Sundance Film Festival alongside renowned actors Rebecca Gibney, Brenda Blethyn, Frankie J Holden, Emma Booth, and esteemed director Gillian Armstrong. In 2011, Hannah received a performance scholarship to attend The McDonald College for musical theatre. Since then, she has been involved in a plethora of popular productions, Most recently starred as Glinda, in the Arcadians Theatre Company's production of ‘Wicked’ alongside such roles as Mary Magdalene in 'Jesus Christ Superstar', Rumpleteazer in 'Cats', Mary Lane in 'Reefer Madness’, Sally Brown in ‘You’re A Good Man Charlie Brown’ and in March, Hannah looks forward to take on the role of Belle in Miranda Musical Society’s Production of Beauty and the Beast alongside her brother who will be reprising his role as Lefou. In 2012, she was nominated for 'Best Actress in a Featured Role in a Musical' by the Canberra Amateur Theatre (CAT) Awards for her role as Eponine in the Roo Theatre's production of 'Les Misérables'. Hannah runs the musical theatre classes at the Roo Theatre, where she can combine her love for directing with her passion for teaching; Roo Theatre's production of '13', both directed and choreographed by Hannah, has already seen her achieve great success in this field. Hannah has received vocal training by the esteemed Jane McIntosh, Jackie Cooper and Patricia Ortell, and has been a vocal tutor within the Wollongong region for 5 years, She is also is a recent committee member with The Australian National Association of Teachers of Singing (ANATS).